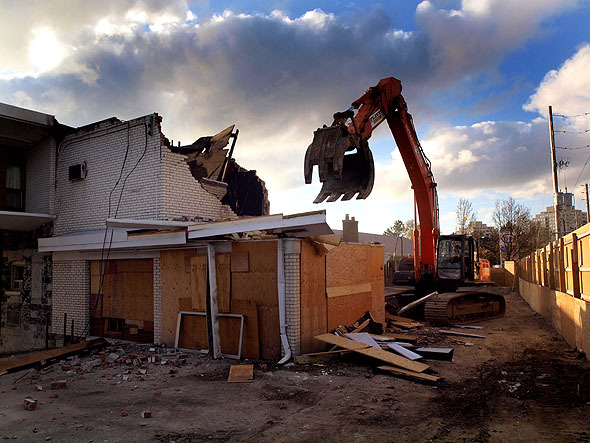 The metal jaws of the excavator are tearing down the walls of the reception area of the Beach Motel while councillor Mark Grimes talks about the history of the Lakeshore motel strip, the last piece of which is coming down behind him. "It's a sad day, but it's an exciting day at the same time," Grimes tells me over the sound of crashing masonry, while TV news crews film the demolition and the media interview small groups of locals who've come to watch the Beach disappear. In the background men in hard hats wait around for the early morning show to end so they can get to work. The last time I saw the Beach Motel was in July of last year. It was already closed, and the owners were selling off the contents from the glass-walled room out front where guests once checked in. 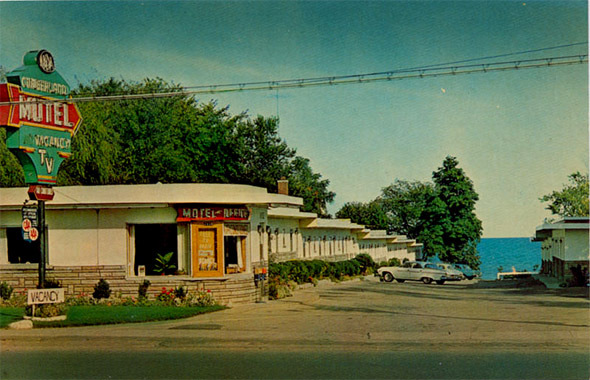 All the good stuff was gone, and all that was left were some old CRT televisions and bits of furniture and artwork from well past the Lakeshore motel strip's far more collectible '50s heyday. A few months before that the owners had left old mattresses leaning against the walls of the motor court outside, signs pinned to the striped mattress fabric: "Free Mattress & Box springs (mostly double beds)." Underneath someone had helpfully written in marker, "some more stained than others." 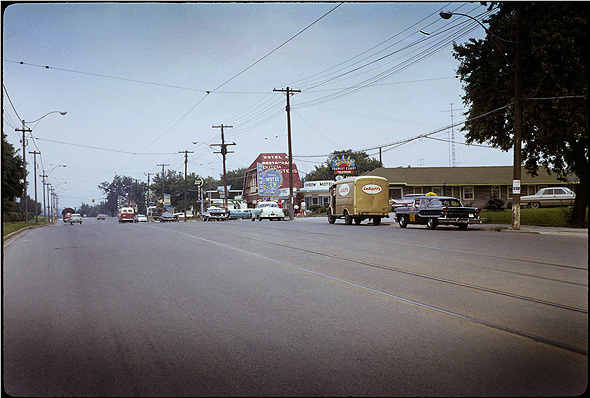 Grimes, councillor for Etobicoke's Ward 6, sums up the history of the area in a nutshell - built beginning in the '20s and '30s, it had its zenith in the '50s before slipping into squalor and criminality in the '70s and '80s (photographer Patrick Cummins documented the area here and here in January of 1983, when its decline was terminal). Its fate was sealed thirty years ago when the province and Metro Toronto Council put a special interest on the property, with a view to having it redeveloped. That development took a bit longer than anyone expected, and motels at the far end of the strip like the Beach, the Shore Breeze and Casa Mendoza's Mendoza Inn lived in a twilight state for decades while their neighbours to the east - the Cruise, the Hillcrest, the Rainbow, the Palace and others - closed and were plowed under to make room for the condo towers that have marched steadily west from the Palace Pier towers at the mouth of the Humber River. I hung around the motel strip in its final days working on a story, never published, for a now-defunct local news website. While I was there I met Teresa Bodzan, who with her business partner ran the Casa Mendoza and its attached motel for over twenty years as the Lakeshore strip shrank around her. She complained that she'd just had to pay thousands to repair a broken water main in her parking lot; money out of her pocket as the owners of the property had put her on a month to month lease, and took no responsibility for any costs of running the restaurant and motel. Teresa talked about the history of the place, beginning as a boatyard in the '20s that built Fairmile motor launches for the Royal Canadian Navy during World War 2. 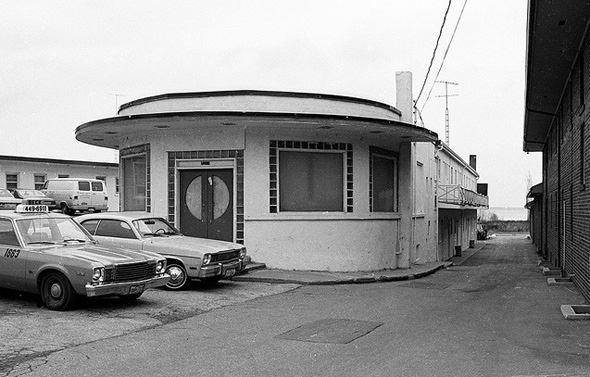 After the war the owners opened the Dutch Sisters Inn, a popular eatery on the then-thriving motel strip, which became Casa Mendoza in 1974. Reviews of the restaurant marvel at its almost comically overdone Latin American ambiance, which pulled at least as many tourists as locals. Yelp! featured a reminiscence of Casa Mendoza written just after Teresa closed her doors for the final time at the end of last year. A former bartender now living in Calgary recalled the place at the end of the '80s, when it was run by "a big, scary Argentinian guy named Sandro" who was chummy with the owners of the House of Lancaster, a nearby strip bar. "Often times at around 1am," he writes, "I would be asked to close the bar and get everyone out quickly because we were going to reopen to private invitees that included many of the House of Lancaster's exotic dancers. 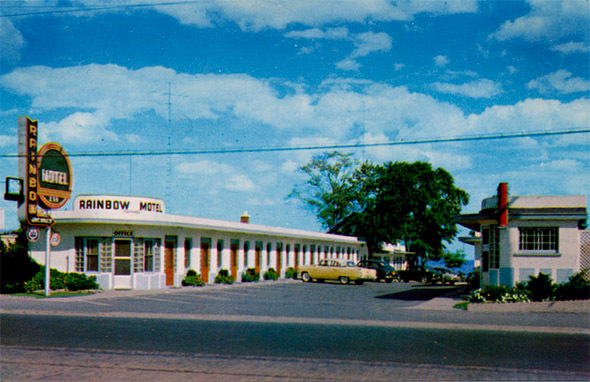 Conveniently, many patrons ended up in the seedy attached Motel." Not long afterwards the bailiffs arrived to take over the mismanaged Casa and its motel, and the owners turned it over to Teresa, its last proprietor. 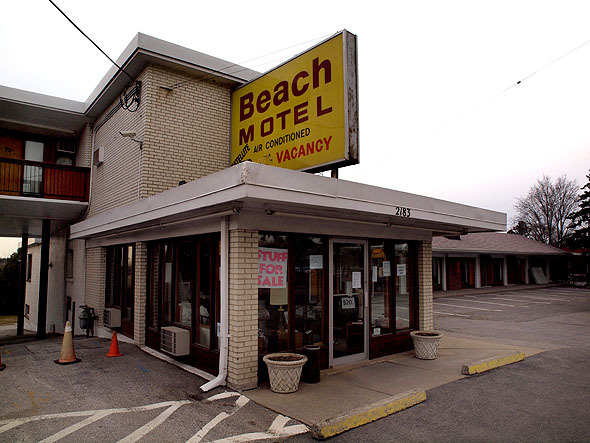 As the excavator pulls down the Beach, Mark Grimes recalls the strip's low point, when the police would look for fugitives and suspects by cruising the Lakeshore strip and running license plates. He tells me that the area's renewal was probably guaranteed thanks to its prime location and lakefront views. "I used to call it the million dollar view but it's the billion dollar view of the city of Toronto. I think behind here is the best view of the city of Toronto skyline, bar none." Standing on the patio of the Casa Mendoza in July of last year looking at that million dollar view, Teresa Bodzan said that if she had the money she'd buy the property and keep the place open forever, but that she didn't think that was remotely possible. A petition was organized by locals regulars to keep the place open, but it didn't do much, and she said it was a struggle living with the insecurity. 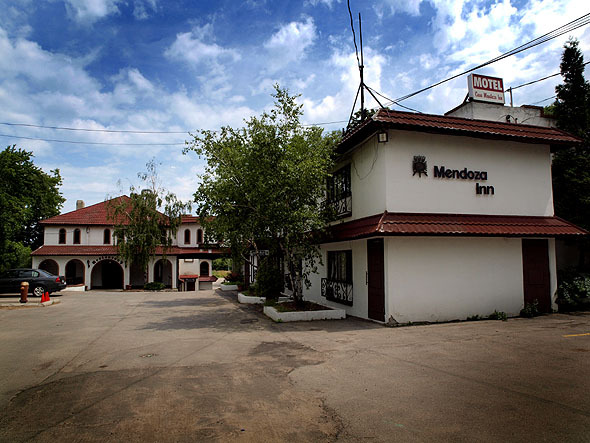 There was a desperate atmosphere at the Casa Mendoza in its last days, and it underwent the mixed blessing of a Restaurant Makeover in 2006. To be sure, the dining room smelled of rancid fat and the motel had gotten some scathing online reviews, but it still packed a crowd on weekends and was full for its New Year's finale. 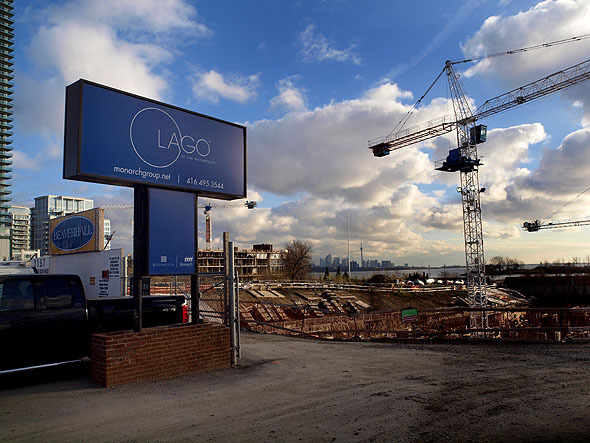 Last week all that remained was the sign, now advertising the Monarch Group's Lago development, and a huge hole. 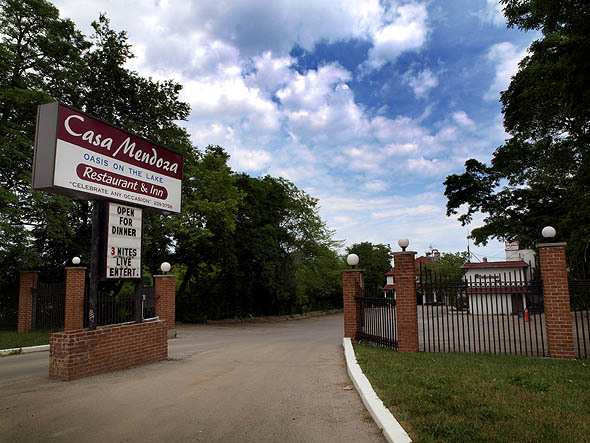 Even before Casa Mendoza closed, Teresa knew that her motel was fated to become a road linking Lake Shore Boulevard with Marine Park Drive to the south, as part of the design guidelines sketched out in The Humber Bay Shores, a plan published in January 2008 by the city. The study stated the city's intention that developers eschew low, squat buildings in favor of podiums and tall, slim towers that would preserve the "view corridors" to the lake and, not incidentally, the billion dollar views that residents were paying for. 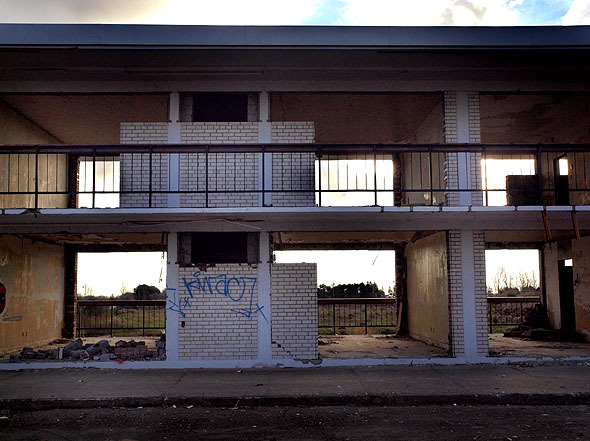 The long dismemberment of the Lakeshore strip probably had to do with the collapse of the markets at the turn of the '90s, and the time it took for developers to assemble the long, thin motel properties into viable plots. "That's happened over time," says Grimes. "It was kind of expedited over the last few years. But everybody knows where their buildings are going to go before they come in with their applications. People don't have their view and then another developer puts another one in front of it." David Golino of Empire Communities is one of the developers building the new Lakeshore strip, and his Eau du Soleil towers, the tallest on the strip at 45 and 66 stories, will rise where the Beach Motel stood until last week. In addition to the towers, Empire will be following the lead of other developers by making public park land part of their project. "Basically on behalf of the city of Toronto and the Toronto Region Conservation Authority, we've taken that on," Golino tells me, "because it's at the tail end of the strip and we're the anchor project. As with most city parks that have been developed in the last 20 years, they've been developed by developers, because the city doesn't have the money to develop them." 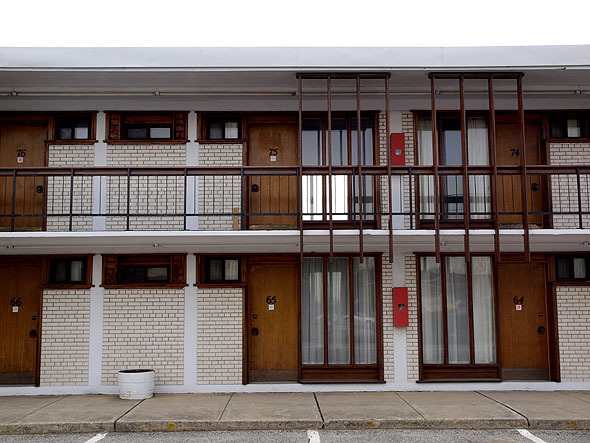 With the demolition of the Beach, the last evidence of the motel strip disappeared, so I ask Golino if Empire has any intention of preserving or referencing the area's past in its design. He says that they didn't (not even in their promotional literature) since other developers had evoked the old strip, and Empire didn't want to follow their lead. He said he'd welcome someone who leased ground floor retail and did something with the motel strip's history, but that they had no plans. Mark Grimes tells me that he managed to save the sign from the Hillcrest Motel, which is in storage, but that there were no plans yet for what to do with it. "Anywhere you put it people might think it's a motel, so you have to figure that out - I think it'd be a great piece of public art. We could only save one - we couldn't save them all - and put it away. This is an important part of our history."